If you would like to join the Lake City Yacht Club please fill out the Membership Application or contact our Membership Director for more information. Club House – At the Lake City Yacht Club, enjoy the million dollar view in a first class facility that is available for member use. The air conditioned club house is a great place to meet and eat. Stay cool by preparing your meals in the comfort of our fully equipped, gourmet kitchen, complete with dishes, glassware, and silverware. 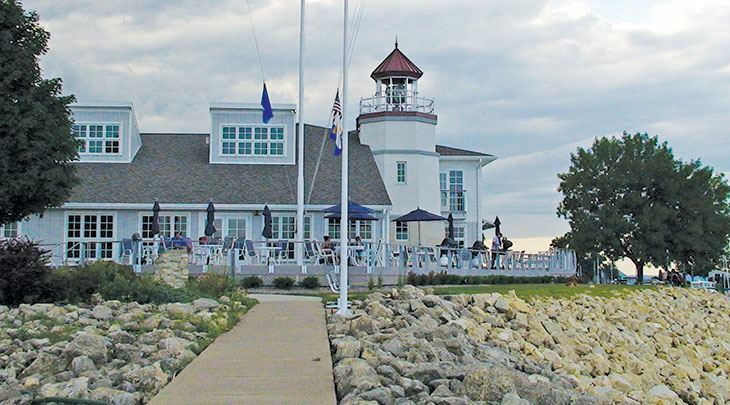 You may also want to enjoy your meal on the members-only deck overlooking the marina and beautiful Lake Pepin. The newly renovated showers, lounge area, and cozy fireplace, perfect for those chilly evenings, complete the scene. When you become a member you are invited to meet and learn from fellow power and sail enthusiasts; take or teach lessons at our Sailing School for adults and juniors; get involved on a committee and socialize with friends and family on land or in the waters of Lake Pepin and beyond. Reciprocity – If you leave the snows of February behind, enjoy the reciprocity available through the Yachting Club of America which includes yachting & sailing clubs in the continental United States, Hawaii, Alaska, and the Virgin Islands. • PEPIN OPEN SOCIAL: Celebrate the weekend event with dinner, drinks and dancing. T-shirts and Raffle tickets are for sale and prizes are given away all evening. • ANNUAL STEAK FRY: Enjoy the “social opener” with a meal from the grill from Huettl’s and remember to save room for some tasty desserts! • SAIL LEUKEMIA: Donate your boat and crew to take guests sailing for one hour cruises. The guest’s donation to the Leukemia and Lymphoma Society helps research the cure for cancer. It’s always a good day when we can share our love of boating with others. It’s even better when it supports a great cause. • DOCK PARTIES: They are a great way to get to know your dock neighbors. On the date of your party, on the dock at your slip, provide a finger food for all. • SAILING SCHOOL: introducing the sport of sailing to students with instruction tailored by a course developed by American Red Cross and US Sailing. Students get on the water training on LCYC sunfish sailboats with experienced Lake Pepin sailors and instructors. • SUNFISH SAIL DAY: Come to the beach on designated Sundays and sail on one of the LCYC Sunfish Sailboats to hone up on your sailing skills. • FAMILY FUN DAY: Games and activities to promote the family values and togetherness are offered on this day. Activities are Sunfish sailing, fish painting, hotdogs, chips, and a fire to roast somores. • LCYC ANNUAL MEETING: Attend the “official” meeting to discuss the events of the season and elect the new board members. • FALL BANQUET: Celebrate together in the Fall–after all the boats have been dry-docked and the boaters are put to pasture. This is the last “social” event for the season. It’s a wonderful night to recognize the accomplishments of our boaters and sailors and those who have helped contribute to our club’s successes during the previous season. The Lake City Yacht Club promotes an active racing program. The Race Program has evolved into a very competitive combination of separate groups of races called a regatta, or a series, that are then aggregated for an overall, season-long prize called Yachtmaster. In addition, between the more competitive Yachtmaster races, there are periodic Fun Races that do not count towards the Yachtmaster prize. These Fun Races are intended to allow less experienced sailors to get used to racing, with the ultimate goal of introducing these new, or less experienced racers to the Yachtmaster Series. The racing program uses a defined handicapping system, called PHRF, that allows all different models of boats to compete among each other, even though the boats naturally travel at different speeds. The system, however, does not account for the experience of the captain and crew. The Yacht Club welcomes all club members, or potential future club members, to participate in either the Yachtmaster races or the Fun races.